If you are a regular reader, you know we don’t always select the players with the most tournament wins. We are always in search of those special players who in some small way, help pickleball grow. This year’s winner embodies what a true champion of our sport looks like. They pretty much lived every pickleball player’s dream. We traveled the country extensively in 2013 and everywhere we went, when we’d ask about people’s favorite players, Jim and Yvonne were always mentioned. They personify what a great pickleball marriage can be. And it seems like one was not mentioned without the other, so we thought it fitting to present this year’s award to both of them. When not visiting their grandkids, they spent 2013 traveling the country conducting clinics and playing tournaments and reaching out to make new friends everywhere they went. We had a lot of great candidates this year, but the thing that swayed our decision more than anything else was what happened at the 2013 National Tournament. At this years Nationals, in every age group event they entered, they stood on the Gold medal stand at the end. That is impressive, but that was not the determining factor. Jim and Yvonne clinched their Player of the Year award in the Open Mixed Doubles event where they made an incredible run before losing in the Bronze medal match. But it was not their play that stood out. Yes, Jim and Yvonne are tremendous players, but it was the overwhelming crowd support that we saw for them that will stick forever in our minds. Every time Jim and Yvonne’s names were announced for a match, record crowds would move to their court to cheer them on in a show of admiration for one of our sports great couples. There is this myth that older players (ok, over 50) cannot compete with the new young breed of fast, quick players who are popping up every day. Jim and Yvonne proved them all wrong as they battled and beat young team after young team along the way. 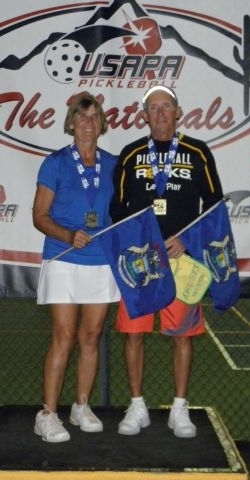 Jim and Yvonne are yet another great example of why pickleball continues to grow in popularity for all ages. 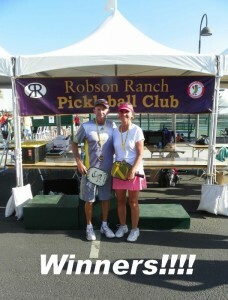 Congratulations go out to this year’s Pickleball Rocks Player of the Year, Jim and Yvonne Hackenberg. They are true winners on and off the court.